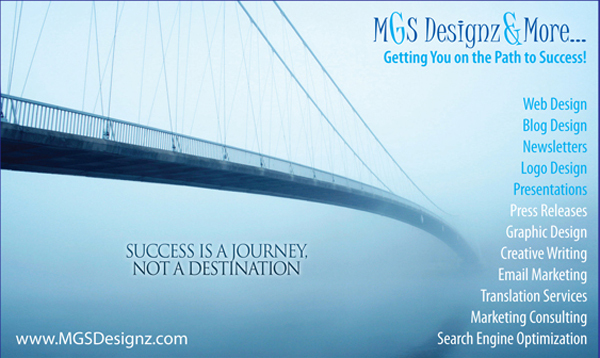 Monthly Marketing | MGS Designz & More! Here is what my monthly services package is all about. I really drive traffic to the blog and website as well as help build likes and follows on the social media sites. This is MAJOR when it comes to Search Engine Optimization – Fresh content on your website means you come up higher in the search engines. I customize the social media sites to match the website design and connect with each other and the blog. I use a program called HootSuite to schedule posts in advance so we have something going out daily and then I share the blogs, coupons and newsletter online after those are published. I posts photos related to your business (or ones you send to me for sharing) on the social media sites to help build likes and follows. I also promote you on my social media sites and drive traffic to your fanpage, blog and website. Everything I design and put out for you I share on my social media sites and I showcase you in my blog. Below is a list of our Monthly Clients. We have a monthly package in which we do blogging email marketing and social media for a monthly fee. Please click on the link to view samples of our work.